the last comic I did drained all my energy for drawing comics & I'm taking a break by doing some animated gifs again. 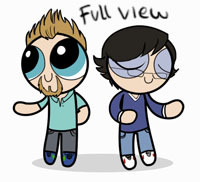 this is one of the powerpuff R&L idea I had from ages ago which I still haven't animated, until now. I remember this GMM ending with them goofing off and playing on the playground and it looks like they were wearing flip-flops. it's so cool that they showed this on Buddy System. Especially when they had the second season with them seesawing. and neither of you had to pay powerpuff girls. 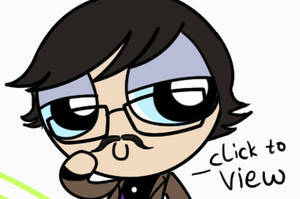 Wait, you actually drew this and Rhett and Link actually showed it on the show!? AWESOME!!!! They featured this in Buddy System!! you should be proud!!! they liked it so much they put it in their show! MY Friend!!! 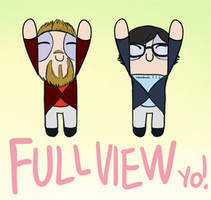 Your Powerpuff Rhett & Link made it into the new Season of Buddy System!!! In Episode 5, where Rhett sings "Family Man" in a car, your Gif is seen on a screen!!!!!! omg. yes. YES, they actually featured it! A couple of months ago someone from the production team mailed me & said Link found this gif online & wanted to feature it on the show. I kept repeating "this is such an honor" to him lol. Sadly I can't watch the episodes cuz I don't have Youtube red.. They're having fun playing on the seesaw. After all in this gif, this was so much fun. Awww.... I love Rhett n Link! it's what indonesians usually call it, though i'm not sure if the word itself is exclusively indonesian, maybe other southeast asian countries call it jungkat-jungkit too.